Those of you who have been following this Blog clearly have way too much time on your hands but we thank you anyway! 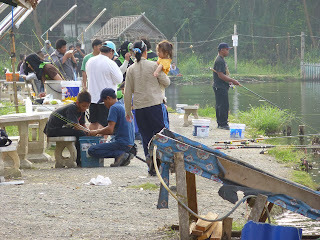 As you know we've been to BoSang Fishing Park quite a few times. The main species there is the Striped Catfish which can grow to ridiculous sizes. 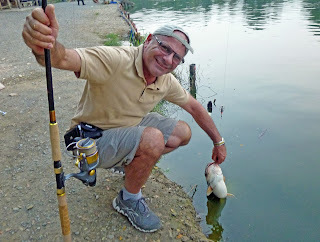 But, it can get a bit "samey" pulling out one large catfish after another and let's face it, they're not difficult to hook. I wanted a change, a new challenge so to speak. 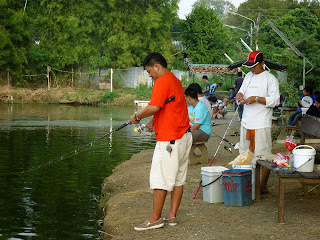 A week or so ago we visited Chiang Mai Fishing Park. This is a REAL family fishing park, quite typical in Thailand complete with a small restaurant, cold beers, a basic tackle shop and a tannoy system piping traditional and pop Thai music to all and sundry. The only written English we could find there were the words "men" and "women" at the toilets. Reading the restaurant menu was possible as long as you spoke and read fluent Thai. This was not a problem for us as we'd already eaten lunch. As you can see it gets busy. There's a main lake where the predominant species is the Striped Catfish. 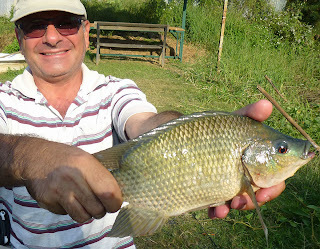 They don't get as big as the monsters at Bo Sang but they're just as obliging when it comes to taking your bread bait. I was happy to catch one or two but it all seemed a bit repetitive. As you can see from the photo above the catfish at Chiang Mai are not shy to pose for the family album. So, what to do for a change? Luckily Chiang Mai Fishing Park also has four smaller lakes - well, ponds really - which are stocked with Nile Tilapia, Pacu and one or two other species. 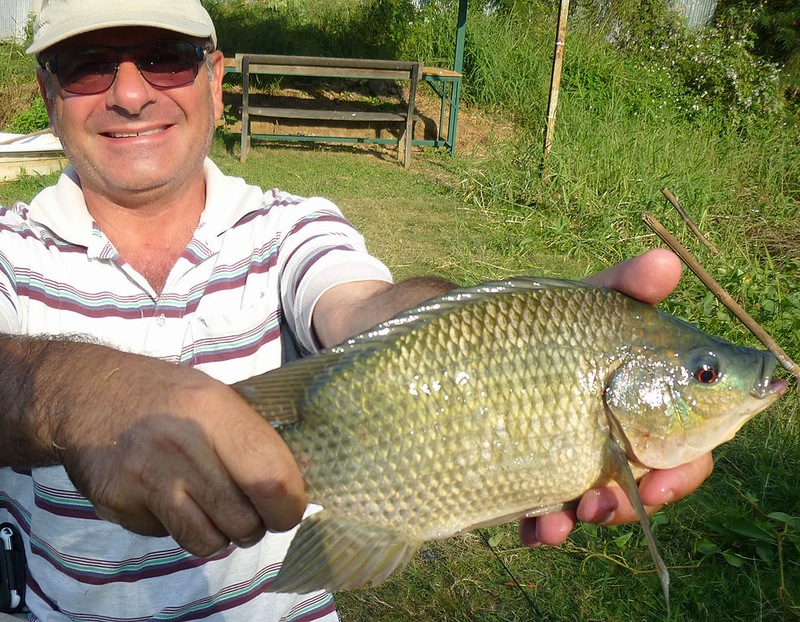 These are VERY hard to catch and the Tilapia in particular require fine line tactics to hook. 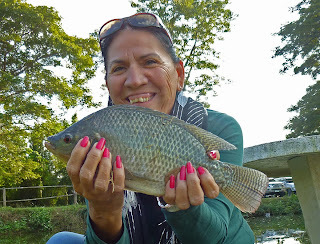 I can tell you it took 2 more visits to the park for me to catch my first small Pacu. The tilapia simply wouldn't be caught. That changed today. We hit the jackpot with twelve nice Tilapia in about 2 hours of fishing. All were released although you do have the option of taking your catch home as long as you pay for it by the kilogram. Not the biggest fish we've caught on this trip by any means but amongst the most satisfying and enjoyable. 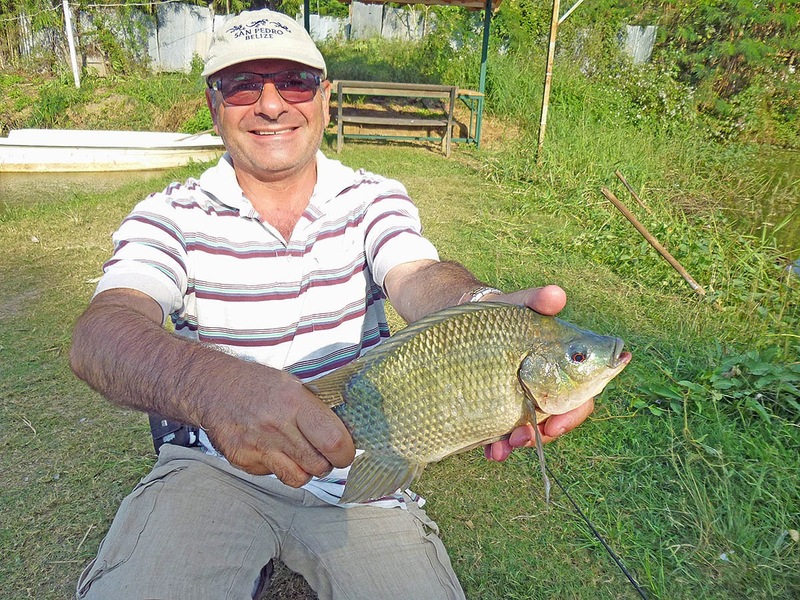 Nile Tilapia are hard fish to catch in the local fishing parks. We've seen the locals spend hours trying to catch one or two for supper. There had to be a way. I watched a guy catch 4 in the space of an hour, easily the best we'd seen for this species at this venue. He was very obliging and showed me what I was doing wrong (everything). So, by using careful scientifically proven research methods (ask a local who knows what he's doing) we became experts ourselves in the fine art of catching these VERY shy fish at Chiang Mai Fishing Park. Yes, Mrs. Fish In Thailand caught the biggest one but I'm not complaining because I lost one MUCH bigger than hers. Oh wait, that's not good, is it? We'll try and visit this amazingly fun venue again in the next day or two. Price for the 2 of us to fish for a couple of hours? About 90 cents U.S. each. They also have an annual membership scheme where for the princely sum of 1000 Thai Baht (about 32US) you can fish all year for free.